Belvilla Europe Cottages - choose accommodation in Austria, Belgium, Croatia, Czech Republic, Denmark, France, Germany, Hungary, Italy, Luxembourg, Netherlands, Portugal, Slovakia, Spain, Switzerland, Turkey. Ski Chalets too. If you're looking for a cottage holiday in Europe, or a ski chalet, Belvilla maybe the answer to holiday prayers. 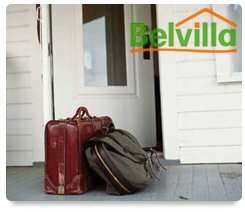 Belvilla are a Netherlands based holiday company, which specialise in self-catering holiday accommodation in Europe. Choose from European destinations such as Belgium, Croatia, Czech Republic, Denmark, France, Germany, Hungary, Italy, Luxembourg, Netherlands, Portugal, Slovakia, Spain, Switzerland and Turkey. You have over 18,000 different properties to choose from, so there is bound to be something which suits your taste and budget. Looking for your next ski chalet? Belvilla can help you there too. 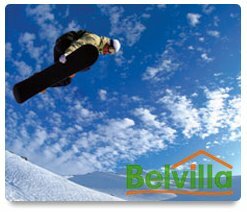 Belvilla have a host of chalets suitable for the winter sport fan. And with 2,000 ski chalets and apartments to choose from in Switzerland, Czech Republic, Germany, France, Italy; you will find the ski chalet in the area you're looking for. Ski chalets from Belvilla come in a variety of sizes, from a smaller apartment which sleeps 2 people, to a larger chalet to take the whole family. If you've got a group of friends who are looking for a ski chalet, you'll find something for you too. Some of the accommodation even comes with its own private sauna; what better way to relax after a long day on the ski slopes. Finding the ski chalets from Belvilla is an easy process, just choose the "ski chalets" option on the top navigation bar on the Belvilla web site. This will enable you to find the ski chalet you're looking for. We all want to get the best deal on our next holiday, so Belvilla have a created an area on their website containing some last minute bargains and special offers. For cheap ski chalets, special offers on cottages in France, and general discounts on all cottage breaks in Europe, have a look at the Belvilla special offers page. If you can't find any special offers which tickle your fancy, have another look tomorrow. The offers change all the time, so you may find that ski chalet you've been looking for, at a fraction of the original price.